The best appetizer I’ve ever eaten was a caramelized onion and goat cheese cheesecake. I experienced this sweet-but-not-dessert cheesecake on the Isle of Skye in Scotland. Almost every restaurant on the island had a menu of twenty variations of fish & chips, and after the nausea-inducing ferry ride, seafood was not something that I wanted to consume. Finally, we stopped at this comically expensive restaurant that was attached to a hotel, and the cheesecake was on the menu. These empanadas pack just as much flavor as the cheesecake, and eliminate the need for a springform pan and a 2 hour baking and cooling time time. They can be pulled together and baked in just under an hour, and frozen unbaked for up to a month. Preheat the oven to 350º fahrenheit and take the crust out of the fridge to be brought up to room temperature. Heat the oil in a skillet over medium heat and add the onion. Season with salt and pepper. Reduce the heat a tiny bit and cook, stirring occasionally, for 25 minutes (or until nicely browned). Add the garlic and cook for an additional minute. Transfer the onions to a large bowl and let cool for five minutes. Add the goat cheese and lemon zest, and mix until just combined. 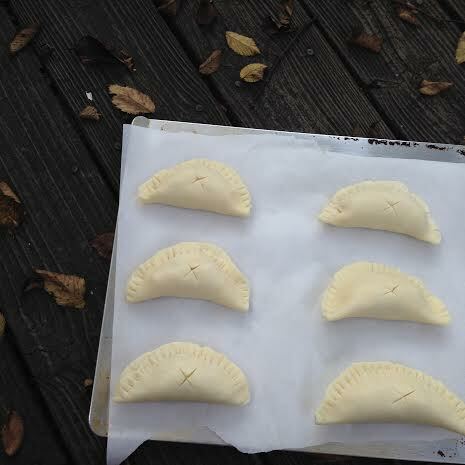 Roll out the pie dough and cut out three-inch rounds. Put a rounded tablespoon of the filling in the center of each round, and secure the dough around it in a half-moon shape (dab a few drops of water on the dough to help it stick). Seal/crimp the edges with a fork. 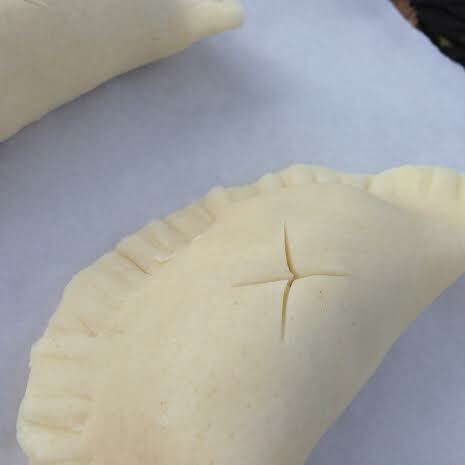 Cut an X in the top of each one, and brush with egg wash. Make sure to cover the entire surface in egg wash, or the empanadas will end up having a few naked spots! Bake on a baking sheet lined with parchment paper for 15 minutes, or until golden.